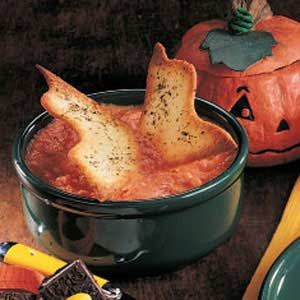 This soup is accentuated with toasted "bat wings" that you cut out of white bread. 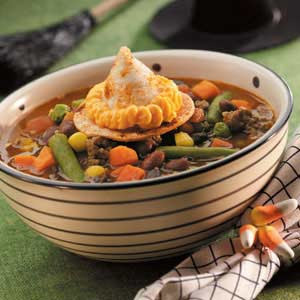 This recipe is found in Martha Stewart Living. 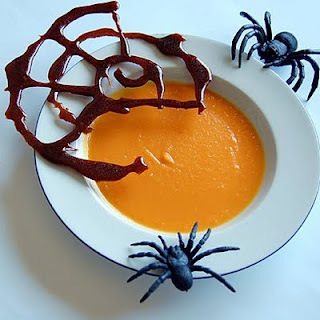 It's a simple homemade tomato soup garnished with olives made to look like eyeballs and a creepy crawlie. One of the simpler soups to make, since you're just basically opening up a jar of soup, heating it and decorating it with chips. Another Taste of Home recipe. You make the witch's hat from tortillas that you shape into cones. You then decorate them with Cheese Whiz. 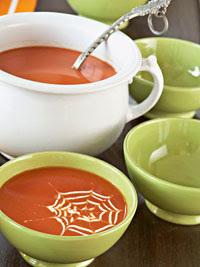 Instructions for how to pipe a decorative spiderweb on top of soup. 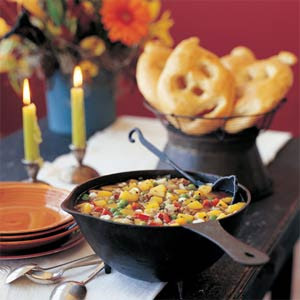 Not very Halloween-y in particular, unless you serve it in a cute skillet with bread pumpkins as shown. 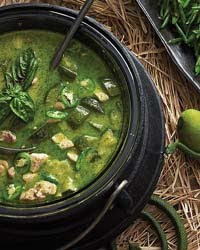 A more gourmet soup idea involving broccoli. It's then decorated with hardboiled eggs and black olives. 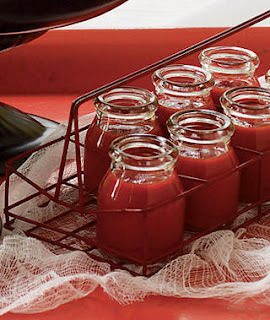 Making the soup is the easy part of this recipe: sourcing the perfect little jars and serving pieces for the soup shots is the hard part. 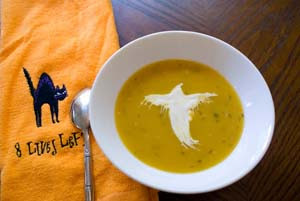 Another recipe where it's crucial to find an awesome way to serve and display the soup. Unfortunately the "how to make the ghost" part of this recipe is incomplete, but I bet you can figure it out just from the cute picture. 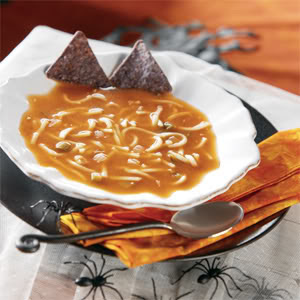 The soup sounds so yummy, my mouth is watering right now. And I don't even particularly like squash! 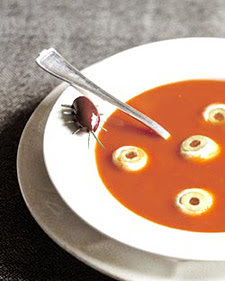 For a soup that's a bit spicier than those above, try this one. It calls for coconut milk, cayenne, and cumin seeds. Another Martha Stewart recipe. 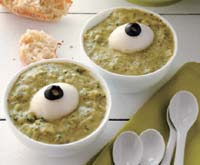 This definitely looks like something green and ghoulish that a witch would be simmering all day long in her witchy kitchen! The really cool spider web in this pic is made from a reduction of sugar and black beer. 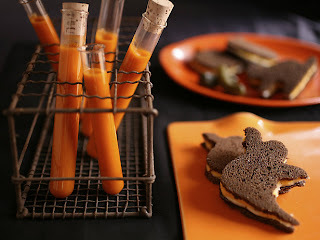 A good source for the tiny jars for the shots soup, is if you have a Trader Joe's in your area you can get a 4 pack of yogurt in little glass jars just that size.